Adirondack Labradoodles (and now Mini-Goldendoodles) are pets that are going to be around for the long haul ! When you adopt an animal companion, you want to know that they have the best chance of having a rich life and enriching your life ! Labradoodles and Mini-Goldendoodles are all about enriching their people's lives, so we want to breed pups that can do that for many years, trouble-free. 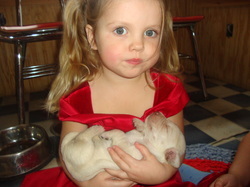 As responsible NY breeders, we provide home-raised, well socialized, healthy labradoodle puppies one litter at a time. All of our GOLDENDOODLE and LABRADOODLE puppies are vet checked and up to date with vaccines and worm meds, and covered by a health guarantee. Our puppies have begun potty and crate training, are frequently bathed, and know how to get their nails trimmed. Best of all they know how to be part of a family! 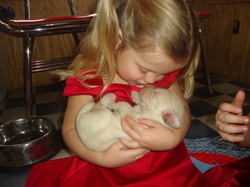 Our six children spend time with each puppy, everyday, so the puppies leave here knowing how to be a secure member of your family. Fiona and Chaco -We make F1B's together!! 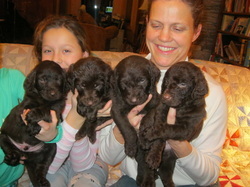 Labradoodle and Mini-Goldendoodle Puppies for your Family! 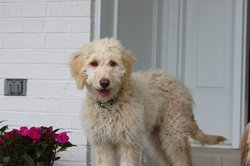 New canine parents are carrying the torch for Adirondack Labradoodles and Goldendoodles! Prince is our male AKC Chocolate Standard Poodle and Calvin is our AKC Cream Standard Poodle, and they are both proving to make sweet pups. 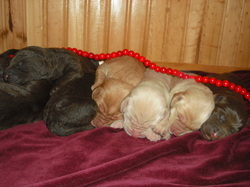 Sandy and Sadie, F1 cream Labradoodles, and Lucy an F1 Goldendoodle, are the new mamas, and making three colors of puppies! 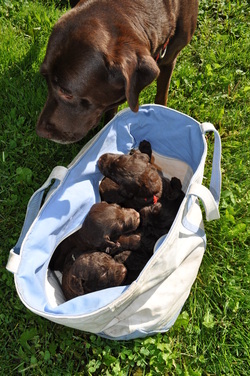 With Prince as the sire, we have produced a lot of beautiful chocolate F1b Labradoodles, and in addition we have creams and blacks and Goldendoodles too! We love the look, and we think you will too! You can see some of their pictures on the Photos page. They are all in their new homes now. Hi to our puppy people! Go see your puppies photos, and send us more anytime!